Image caption Finance Secretary Derek Mackay told the SNP conference that he would take a "responsible approach to income tax"
The Scottish government is considering substantial changes to Scotland's tax bands in order to bring in more money for public services. BBC Scotland has learned that ministers are reviewing the income levels at which people begin to pay higher rates of tax. They could decide to change those, or introduce new bands altogether. The final decision will be unveiled as part of the Scottish budget later this year. The Scottish Parliament has had full control over income tax rates and bands since last year, but the SNP administration has so far resisted calls from opposition parties to use the powers to raise income tax rates for high earners. Instead, last year's budget saw ministers opt to make relatively minor changes by not raising the point at which people start to pay the 40p rate of income tax on their salaries, as happened elsewhere in the UK. BBC Scotland's political editor, Brian Taylor, said he had been told that ministers were now looking seriously at changing the tax bands for the coming year. He said: "That might involve lowering the income level at which you move into higher rates, but it could also mean entirely new bands in Scotland." He said ministers were also examining the possibility of increasing taxes for the highest earners, but because Scotland has so few of those it is thought the move would bring in relatively little income. And he said the new plans were likely to protect the lowest earners, but might mean those on middle incomes paying "a bit more". What are the Scottish income tax rates and bands? In his speech to the SNP conference on Tuesday afternoon, Finance Secretary Derek Mackay pledged to take a "responsible approach to income tax" in his forthcoming budget, which will need the support of at least one other party to pass. While the Scottish Conservatives have repeatedly urged the SNP not to make Scotland the "highest taxed part of the UK", Mr Mackay insisted the Tories' policy on tax "simply does not add up". 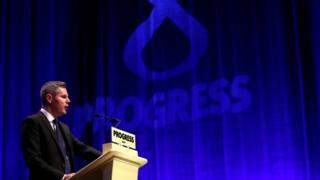 He told delegates at the event in Glasgow: "Setting taxes isn't easy. Taxation isn't a toy - it has an impact on people's lives and their choices and as a government we take that responsibility very seriously." SNP leader Nicola Sturgeon, the country's first minister, has previously indicated that she wants a discussion on "responsible and progressive" tax policies, and has invited other parties to come forward with their suggestions. Mr Mackay told the conference that the Liberal Democrats and the Scottish Greens - who both favour tax rises - had contributed, but said he had heard nothing from Labour, which also backs higher income tax in Scotland, or the Tories, who do not. The Scottish government has already confirmed it will end the public sector pay cap in next year's budget, but Mr Mackay warned his ability give staff a wage rise could still be "constrained" by UK Chancellor Philip Hammond.